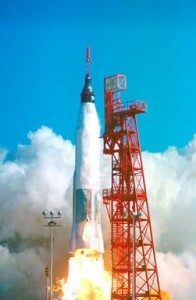 When Grissom piloted the Mercury-Redstone rocket Liberty Bell 7 into suborbital flight, it nearly ended in disaster when the exploding bolts on the hatch of the small capsule blew off prematurely after splashdown in the Atlantic Ocean. Flight controllers in Mission Control, watching Grissom slowly submerging on their television screens, sat frozen in their chairs. 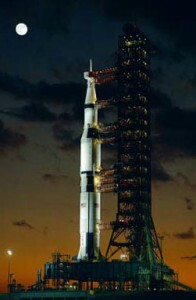 NASA officials, already wary about the practice of letting the astronauts name their own capsules, balked when Gus Grissom proposed naming his Gemini capsule Molly Brown after the popular Broadway show The Unsinkable Molly Brown a joking nod to his Mercury capsule Liberty Bell 7 sitting at the bottom of the ocean. It came as no surprise to those who knew him that Ed White had taken with him in his left leg pocket during his space walk a gold crucifix, a St. Christopher’s medal, and a Star of David. Schirra’s reputation as a jokester was well known within NASA, so his actions on the Gemini 6 flight had come as no surprise when he and Tom Stafford came alongside Frank Borman and Jim Lovell on board Gemini 7. 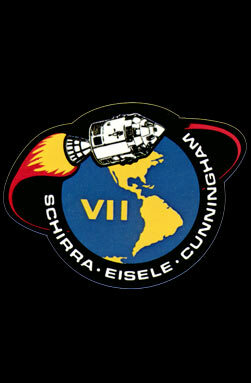 Borman and Lovell had launched seven days earlier and were already orbiting the earth in preparation for the first-ever rendezvous. During the rendezvous, Schirra, a commissioned officer in the U.S. Navy, grinned and held up a sign to his window: Beat Army, for the benefit of Gemini 7 commander and West Point graduate Borman. 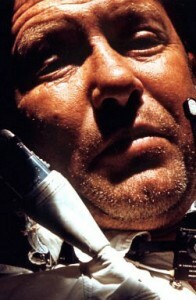 When examining the umbilical cord that would be his lifeline during his space walk, White was asked by a reporter, You certainly have to have a lot of faith in the men who made that don’t you? Christian that he was, White replied, “No, I have to have faith in something greater than man before I would walk in space using that”. Shortly after take-off, the unthinkable appeared to be happening. 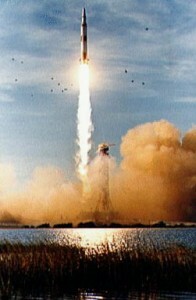 The massive Saturn V booster rocket began contracting and expanding like an angry alligator during its furious ascent. It looked like a runaway circus ride. Walt Cunningham noticed a renewed sense of purpose infusing the ranks of NASA. “My whole mood changed,” he said, “the confidence in my approach to problems, my daily rhythm. I slept better. Food tasted better. My wife looked better. For the first time around the office our crew was being envied instead of being envious” . “You realize that on that small spot, that little blue and white thing, is everything that means anything to you all of history and music and poetry and art and death and birth and love, tears, joy, games, all of it on that little blue spot out there that you can cover with your thumb. And you realize from that perspective that you’ve changed, that there’s something new there, that the relationship is no longer what it was” . “No one in their right mind can see such a sight and deny the spirituality of the experience, nor the existence of a Supreme Being. There were indeed moments when I honestly felt that I could reach out and touch the face of God”. “I poured the wine into the chalice. In the one-sixth gravity of the moon the wine curled slowly and gracefully up the side of the cup. It was interesting to think that the very first liquid ever poured on the moon, and the first food eaten there, were communion elements”. “I’m not a religious person.I do not intellectually believe religious things. However, I ought to believe them, because someone has made them work out for me more than just the odds”. 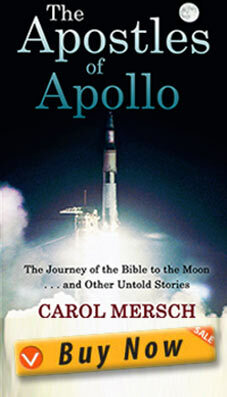 “Of all that I have ever done, in or out of the space program, that night was the most crucial, the most important, and the most meaningful for me, because that was when I learned about the assurance of answered prayer” . “As a result of my experience in space, any doubts that I had about the Universe being a Divine Creation evaporated, to be replaced with the certainty that the physical Universe and its creatures are the result of divine thought and purpose”. “There I was, a test pilot, a nuts-and-bolts type who had gotten rather skeptical about God, and suddenly I was asking God to solve my problems on the moon. I was relying on God rather than on Houston” . “You don’ need to go to the moon to find God. I didn’t find God in space. I found Him in the front seat of my car on Highway 46 in New Braunfels, Texas, when I opened my heart to Jesus. And my life hasn’t been the same since”. 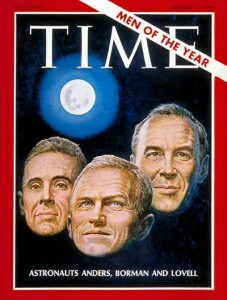 “In December 1972 I was the last man to walk on the moon. 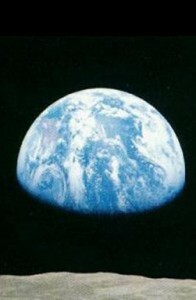 I stood in the blue darkness of the lunar surface and looked in awe at the earth. What I saw was almost too beautiful to have happened by accident. It doesn’t matter how you choose to worship God. He has to exist to have created what I was privileged to see”.